2013, June – An arrangement has been made lately for the distribution of CDR analysis systems for the specific necessity of the dairy industry. The company that will distribute in Brazil two of the CDR Foodlab range of products, CDR Foodlab and miniFoodlab, is Cap Lab. The company provides analytical instruments for food quality control, in particular for milk, cheese and dairy products. It is a leader in the Brazilian market for furnishing analytical technologies for the specific need of the dairy sector. That is why last week Cap Lab representatives, sales director Vinicius Capeto and the technical support Leyre Soares Grosman, came to CDR headquarters in Ginestra Fiorentina, Florence, for a meeting. 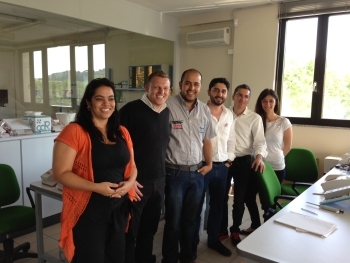 They visited our offices and chemical department and agreed in selling our analytical systems in their country. They let us know that the first occasion for presenting CDR Foodlab and miniFoodlab to Brazilian and international public will be Minas Lácteas 2013, the international exhibition for everything concerns dairy industry, that will take place in Juiz de Fora from 16th to 18th of July. CDR Foodlab and Minifoodlab perform every analysis useful for the operators of the dairy industry and it is studied for milk and milk products (any kind of cheese, cream, butter, yogurth and so on). See more about milk and dairy testing with CDR Foodlab analyzers. Even if it is possible to analyze many other food matrixes through them, CDR Foodlab and miniFoodlab were born to answer the requests of the milk producers. Thereafter their analytical potentials and applications have been widened and enriched. In the dairy sector, they are used in laboratories, at production lines in large factories, in small cheesemakers and in dairy farms. Moreover, the systems are reference method compliant, don’t need to be calibrated and employ such simple analytical procedures that anyone can conclude a test, directly in the farm or anywhere in the plant. Take a Look at CDR Foodlab, that best suits milk producers, cheesemakers, dairy large factories and farms. Dairy products analysis with Foodlab: distribution in Brazil was last modified: December 19th, 2016 by CDR s.r.l.